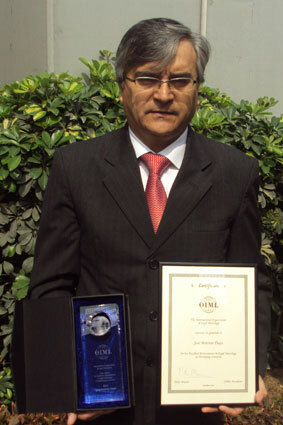 At the 46th CIML Meeting in Prague, Czech Republic in October 2011 CIML President Peter Mason awarded the third OIML Award for Excellent Achievements in Legal Metrology in Developing Countries to two individuals. 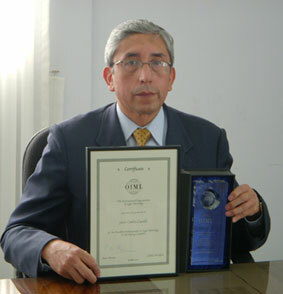 José Dajes is Head of the National Metrology Service at INDECOPI - Peru. Juan Carlos Castillo is Executive Director at IBMETRO - Bolivia. In recognition of their work at their respective National Institutes, Dr. Eberhard Seiler nominated them to receive the 2011 Award. During the SIM General Assembly in November 2011, the BIML presented special trophies and certificates to José Dajes and Juan Carlos Castillo. The OIML extends its deep appreciation to the 2011 Award Winners for their excellent work in legal metrology and wishes them every continued success in their future projects.